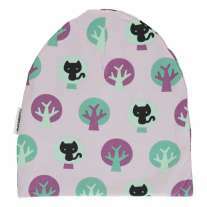 This soft, organic cotton baby bonnet from Maxomorra is lilac with a sweet pastel tree and black cat pattern on one side with plain purple velour on the reverse. Pull it down to keep ears warm and keep it securely in place with the ties. Team up with matching baby clothes from the range. This organic baby hat is ethically made from sustainable organic cotton under fair trade conditions, making it gentle on delicate skin and eczema-friendly. We love Maxomorra's vibrant Scandi-inspired designs and that their kids' clothes are responsibly made with natural materials too. The top ethics and fun Swedish design makes this ethical fashion brand something rather special - great for kids and the environment! 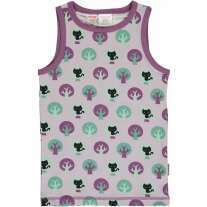 The print layer is made with soft knitted jersey in 95% organic cotton and 5% elastane. The plain inside layer is made from knitted velour in 80% organic cotton and 20% recycled polyester.